What's Your Use and Odometer Reading? For a 2012 model he has quite a few miles. Mine's a 2013 model & I have about 4600 miles on mine now. Thanks RR. I probably should have started a new thread for mileage, don't mean to highjack Turbo's. I'm curious as I guess we all are on how many miles these things are good for. Let us hear how you use your machine and the miles you have on it. Please, we don't need a GPS screen shot of every trip you have taken. Mine is a 2012 with somewhere in the 15k mile range. I haven't checked lately and it takes some math as I have a different ECU with a different amount. One note. The ECU upgrade will not effect stored mile data. A new ECU of different unit will. Mid to high 15s. Hasn't been driven much this winter and has been dissected the past month or so. Still have a good 30 hours worth the work before she sees the road. 2013, got in 2014 and haven't drove in a while... 350 miles, hard and heavy off road miles for the most part. Bent frame cross member, 3 sidewall tire punctures, and a punctured fuel line. Countless smiles, and a new BOR suspention. Bring that thing up to St Helen and we can change that, yet. Ooooh crap! Ya, I say that would do it. Good to know wasn't just from hard use. And by his description it doesn't sound like hard driving? Ha. I don't think kirch knows anything other. Yea, I have a way of abusing my poor machine. Go all the way or go home! Hi, my names Aaron, I live in Mitchell, SD. 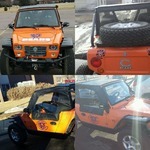 I owned an orange 2012 Oreion Reeper & I lvd it! Kilometers - 9235.2. Getting 34mpg now on Hwy & 26 in town. GO B E A R S! ! ! I just don't see how you are getting that mileage. I only get better mileage when driving under 40mph. Although you all have different gearing then I.
I don't know either mine even keeping it 45 and below the best tank was 26mpg. Possible TJ. I don't always drive like a mad man. Best I ever see is maybe 26 when easy cruising. Start hitting highway speeds and high RPMs and the mileage will suffer no matter if it takes a week to get to speed. I've never seen anything above 25 mpg in mine. That's driving it speed limit on the highway.